UPDATE: All displays are sold. Please visit us at our new showroom at 2 Battery Wharf, Boston, MA 02109. If you've always dreamed of a sleek, contemporary European-style kitchen but were put off by the cost, you're in luck. 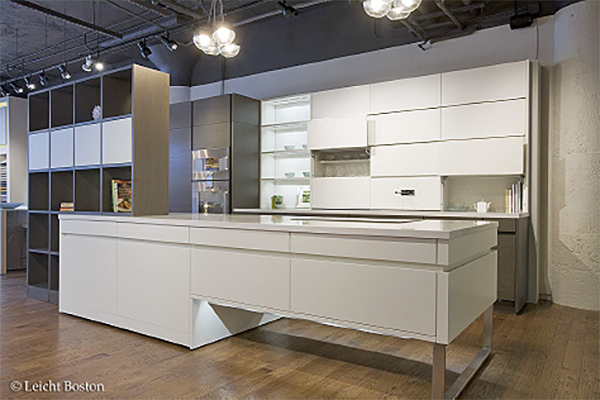 We're moving our Divine Design Center showroom in Boston, and currently selling six of the display kitchens. Each display includes cabinets and appliances from brands like LEICHT and Miele for 70 percent off (for savings up to $55,000). We're also parting with a selection of furniture and storage units, too. Interested in purchasing one of our display kitchens or furniture? Here's a sample of what's up for sale, but you can take a look at the rest of the kitchen displays we are currently selling here, or inquire here for more information about making a purchase. Island in while lacquer handless. Base cabinets and tall cabinets in oak veneer handless. *See product plans for more information.